Korintkakor - "currants cookies" - are very popular in Sweden. It's considered a real classic. 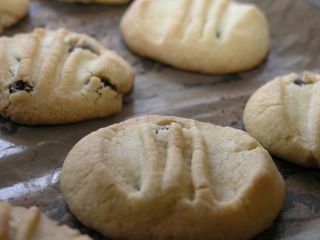 They're really easy to make, and very tasty - essentially a shortbread studded with raisins. Try to get currants if you can, but regular raisins will do as well. Preheat oven to 190 degrees C. Mix the butters and the sugar. Add the flour and baking powder, and add the currants. Mix together. Form small balls of dough, put on a baking sheet, and press down with a fork. Bake for 10-12 minutes - they should not get much color! Hi there, I really like your cookies. It is so simple and looks nice. Do you mind if I send you a questionnaire regarding your creation of a weblog? Well, it’s for sharing your experience in a research and yet profile is kept confidential. I'm enjoying your blog and looking forward to what you creat next! Wow, I don't even know where to begin..those cookies? the baked potato chips? It all looks so good to me!! I love the ones you stick forks on..and how they're warm and crumble in your mouth straight out of the oven. I've never tried that version though, might have to add those to the christmas cookie list.